The house I share with Mr. Q was built in 1904 and was originally the farmhouse for a dairy farm. Since then, the farmland surrounding it was developed and now we live in a suburban neighborhood of split level and ranch style houses. In addition to the house, we have a carriage house and a small summer house. We have lived here for over 25 years. We fell in love with our house the moment we walked in the door. Our real estate agent tried to talk us out of it, trying to convince us that we didn’t want an ‘old’ house. Oh yes we did! And we have never regretted our choice. A carriage house, also called remise or coach house, is an outbuilding which was originally built to house horse-drawn carriages and the related tack. We love our carriage house. It has the original carriage house doors that open to the side and drive Mr. Q crazy in the winter when they get frozen shut sometimes. In the summer I do all of my furniture restyling out here and I hold my occasional Carriage House Sale here. My photo cottage was originally just a play house out back that was probably built on the foundation of some sort of farm out-building. 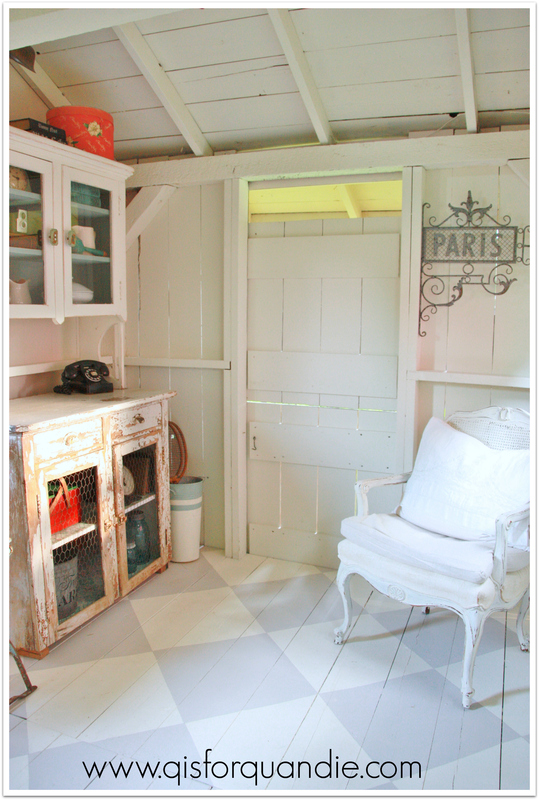 Since we’ve been here it has served as a potting shed, and as a summer house when I had it fixed up as a spot for hanging out and reading, but June of 2014 saw the summer house being converted into the ‘photo cottage’, an area that is now devoted to staging furniture and other items for blog photos! 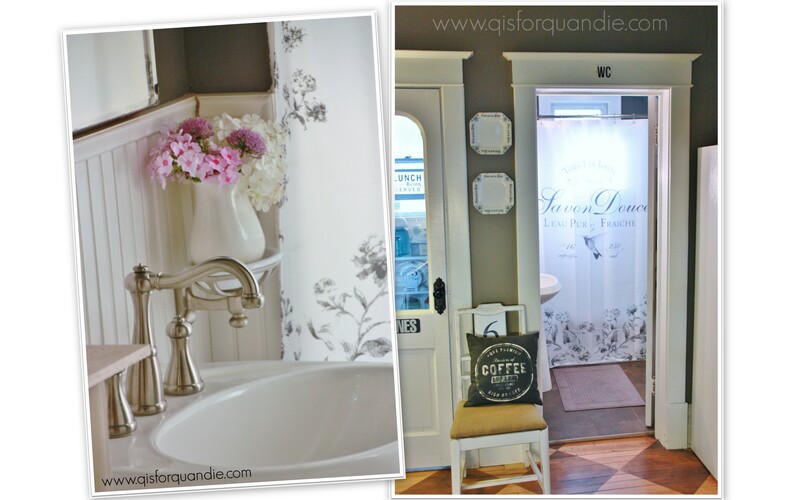 You can read more about the transformation of the photo cottage in this post, and this post. 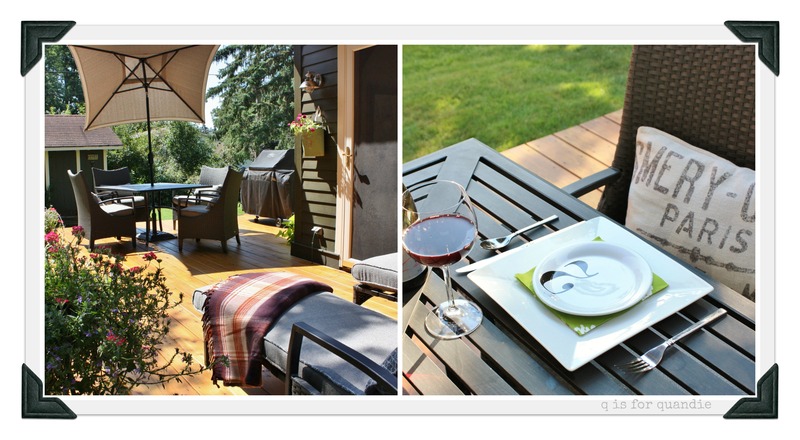 When we first moved into our house, the deck was very traditional with a railing around the perimeter. About 15 years ago we ripped off the railing and put up a pergola and grew a grape vine on it. Ultimately, the grape vine was extremely messy overhead and it drew in critters; bees, Japanese beetles, raccoons. Also, the shade it provided led to premature rotting of the deck boards because they didn’t dry out properly after a rain. So, a few years back we had the deck rebuilt. This time with no pergola, and no railings (it’s only about 2′ off the ground, no railing necessary). It’s perfect for us now, and we use it all the time. In the summer we eat dinner out here nearly every evening. Read about breakfast on the deck here. 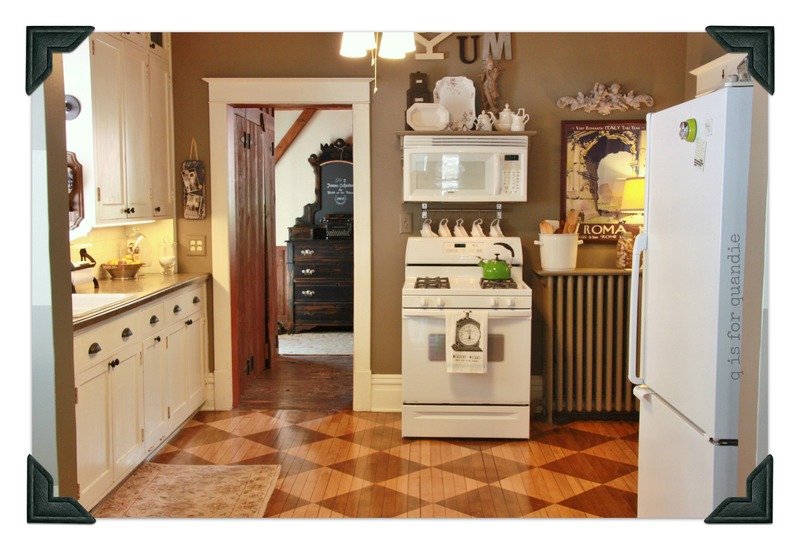 Our kitchen has the original farmhouse cabinets that are over 100 years old and still function perfectly well. We do without some mod cons, no dishwasher, no disposal, no ice maker. That’s OK, we don’t cook much. It works well for us. Read more about it and view a comical 1980’s ‘before’ picture here. 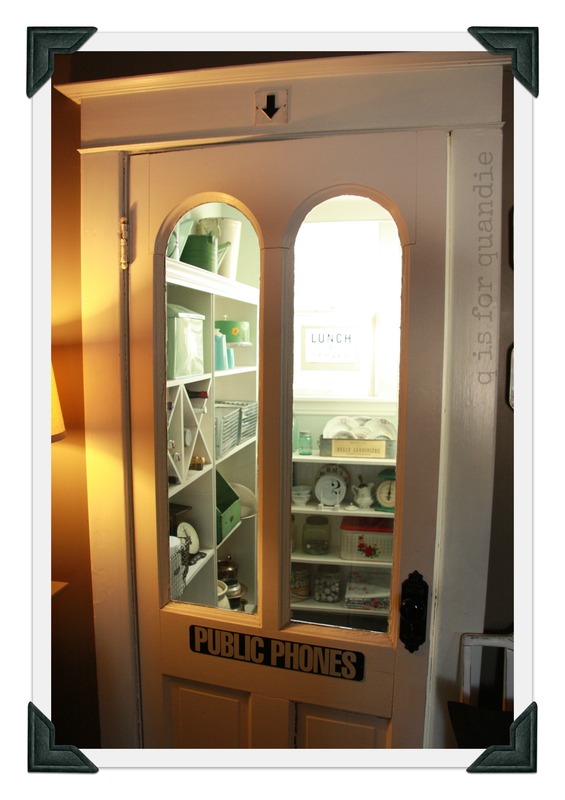 The pantry was an embarrassing mess up until a few years ago when I decided it was high time to fab it up. My main motivation was putting in a door with a window so we could let some of that light into the kitchen. You can read more about the pantry here. The piano room is what traditionally would be the dining room. We had it set up as a dining room for at least 15 years and ate there very rarely. When I got the chance to bring in a baby grand piano, I jumped on it. Do I play? Well, no. I’d like to one day though. In the meantime, it’s fantastic for folding laundry, working on crafts, painting stuff (with numerous drop cloths), and it makes a fantastic bar for parties. 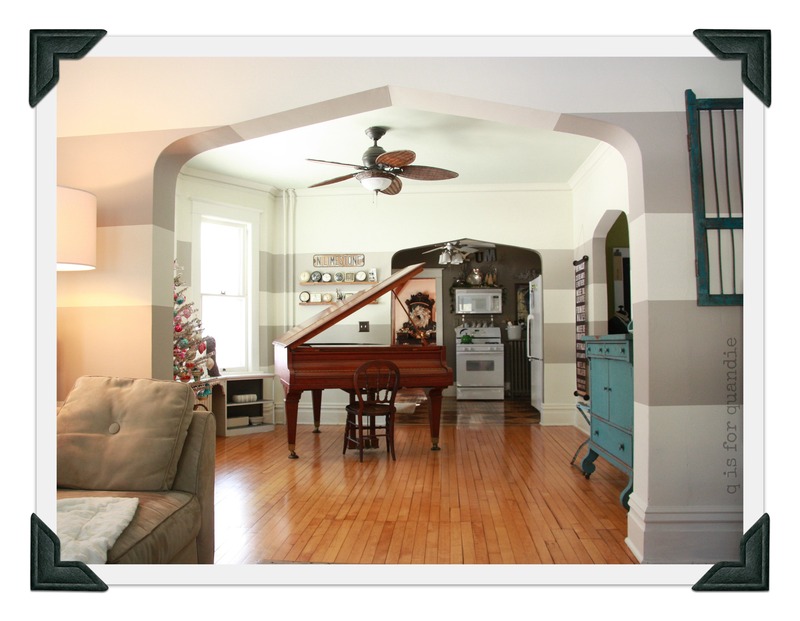 The piano room and living room are only separated by a wide archway, they are practically the same room. You can read more about them here. 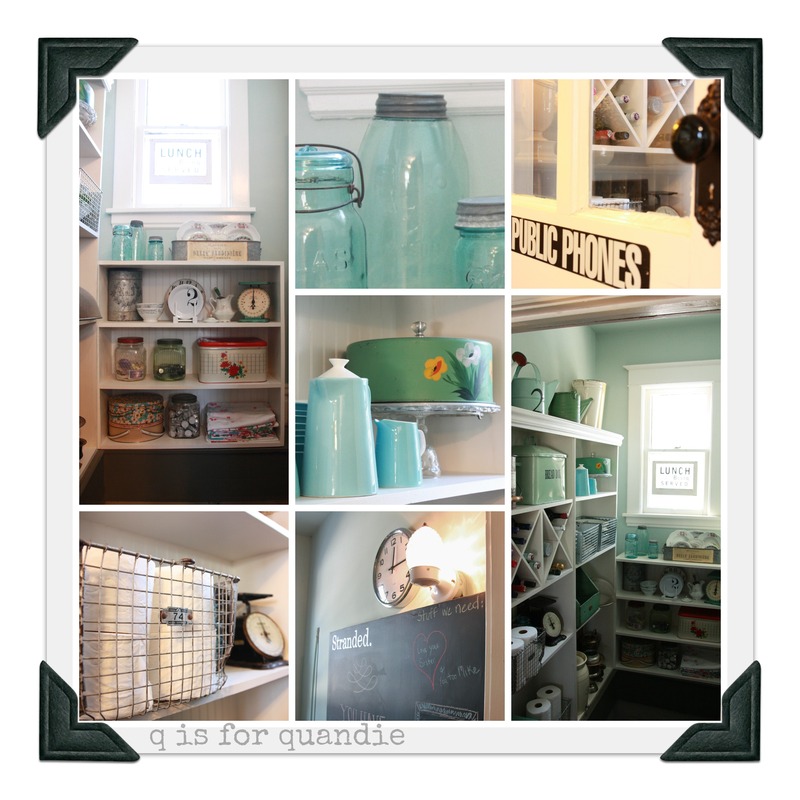 This is the room where I write my blog and store a lot of my crafting supplies. I gave the room a much needed makeover in January 2015. You can read more about that here. Hopefully I manage to inspire people from this room! I added a giant English cupboard to the room in September 2017. This porch is perfect for reading in the evening, or sitting and watching a good thunderstorm in summer. 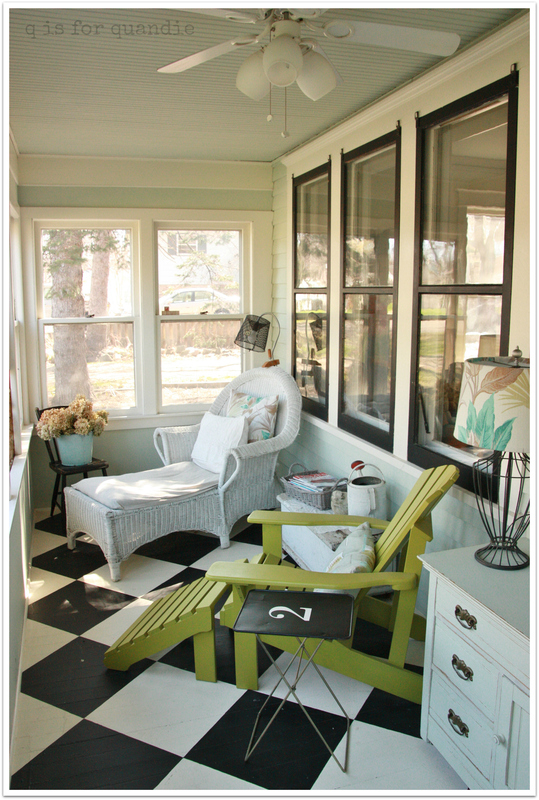 See more of the most recent look on the front porch here. Our master bedroom underwent a makeover in August 2017. We had the floors refinished and we added a ship lap wall. 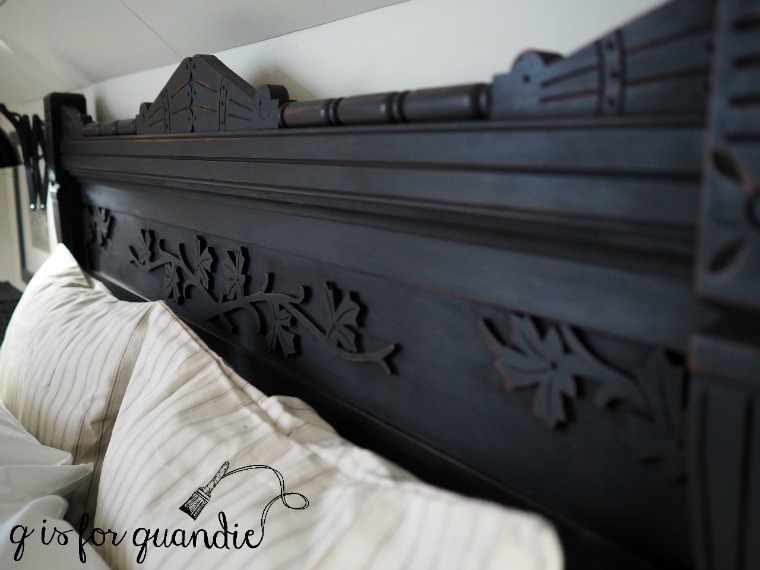 We modified a full sized antique headboard to fit our queen sized bed. I refreshed a vintage cane back bench for the foot of the bed. I repainted the cupboard that stores my clothing. 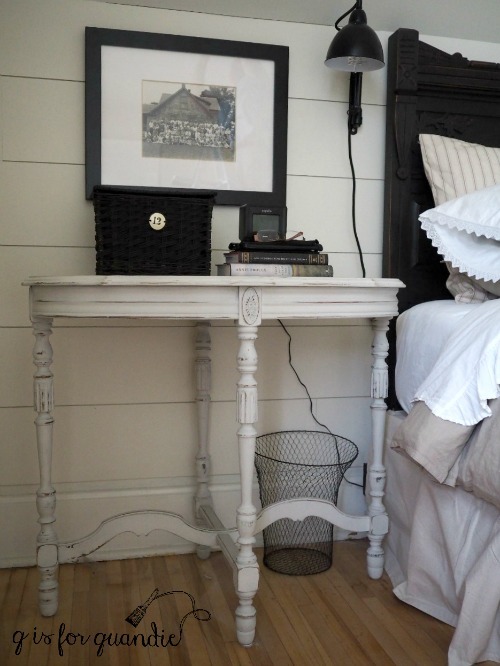 I also repainted our mismatched bedside tables. We’re still completed the final touches on this room and hope to share the completed space soon. 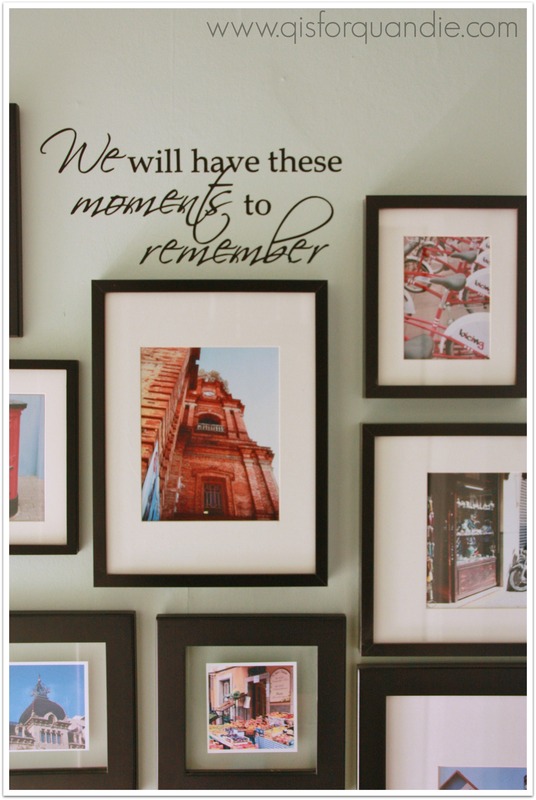 Our upstairs hallway has been devoted to pictures from our travels. See more here. This room is no longer. We recently swapped the guest room and Mr. Q’s study around. The new guest room will be a project for fall 2017. In the meantime you can see more of the former guest room here. 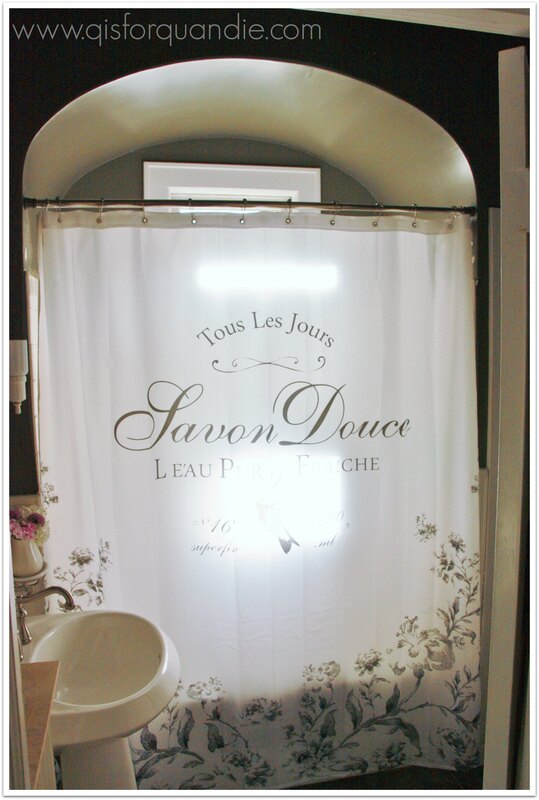 Living in a 1904 farmhouse means accepting the fact that your bathroom is going to be less than luxurious. See more here. While touring our house, you may be lucky enough to stumble across our sweet cat, Lucy. She is the softest, fluffiest, friendliest, most loving cat ever. At least we think so. I’ve never seen this page before. I love every room. 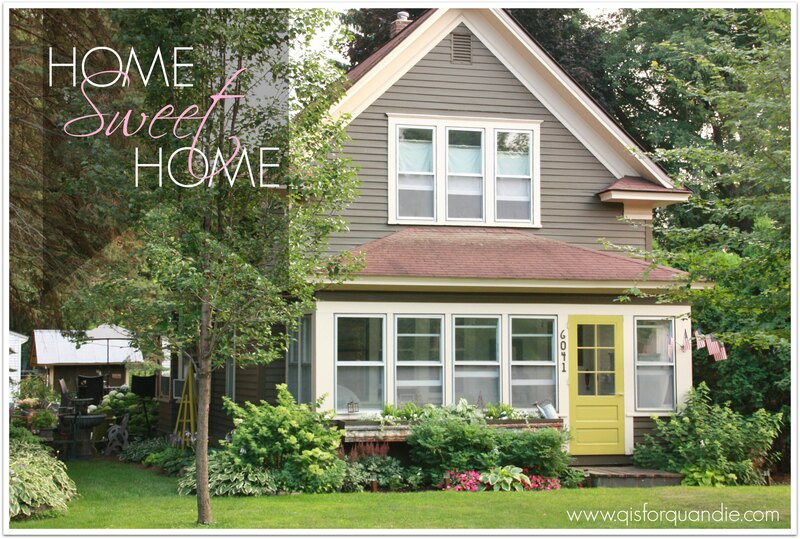 It is a dream farm house with a carriage house, pantry, etc. It is perfect. Thanks Ginene. This page is still a work in progress. I’d have to actually clean each room in order to take photos of it and post them, so it might be a while before I get to all of them (not that I have that many). Now that summer is finally getting here, the indoors will likely be completely ignored for the next 4 months or so. I just loooove your farm house and all the other buildings as well which makes it even more unique! I know just what you mean about loving old houses, you just can’t recreate the same character with a new house! Here in South Africa old farm houses are just becoming more and more scarcer so when we found our farm for sale with various old mud brick houses with their Oregon wooden windows and shutters, we jumped at it! And to boot we have our own 2km beach! We even still have the original ox wagon that family used to travel more than 100 years ago to go to church!! Haha! It’s hard to imagine today, that’s how they had to travel! I also want to mention that I have been reading your blog for a while now and I just lOVE the way you can take any piece of furnite and make it WOW! You are so creative! I have been practicing on a few pieces but am no where near to your standard yet! Thanks for an amazing blog! Thank you so much for you lovely comment Kim! For some reason, I am always thrilled when I have readers from a far away land. I don’t know that I would ever make it to South Africa, but if I do, your beach haven looks amazing. Thanks Georgia! We hired someone to do the floor. The long story is, when we bought our house the kitchen floor was bad linoleum. We were going to rip it up and replace it with tile, but when we tore off the linoleum we found the hardwood underneath. It needed to be refinished, and we weren’t confident we could do it ourselves. I had seen a diamond patterned wood floor in a magazine, so I asked our refinisher to copy it. Basically, he sanded the floor, measured and taped off the squares and stained the dark ones. The light ones are just the natural color of the wood. He did an amazing job, and we love the floor. He said it was a lot of work and he’d never do it again though! I think the hard part is all of the taping! If you are patient, and you are good with planning the layout (math! ), I think you could probably handle it. Stopping by from Town and country living. LOVE your home. 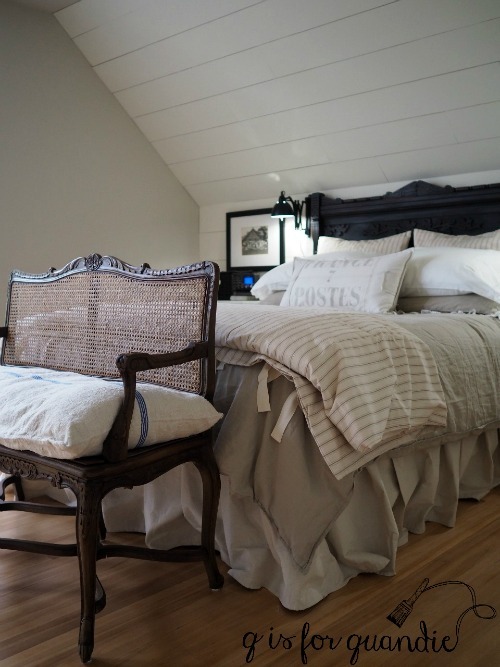 How lucky are you to have a summer cottage and carriage house. And I can’t get over your Stunning furniture pieces. Amazing job! Hi Emily! Thanks for stopping by. 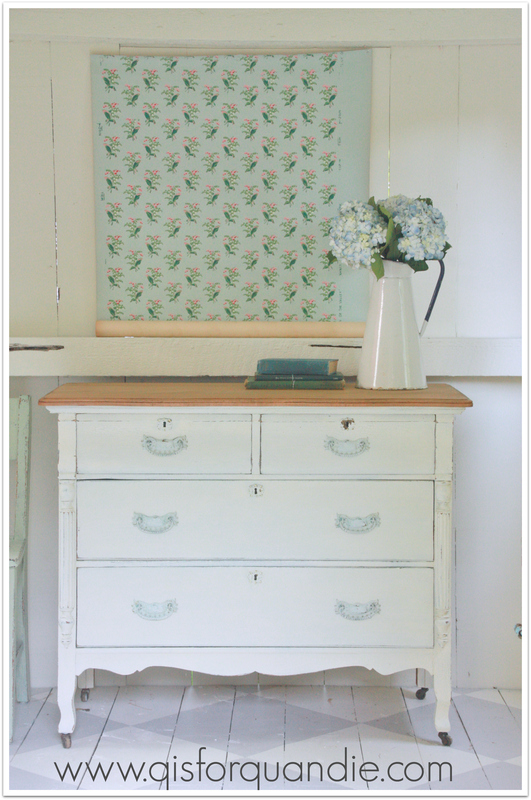 As you can see, I am obsessed with transforming cast off furniture. Stay tuned for more! 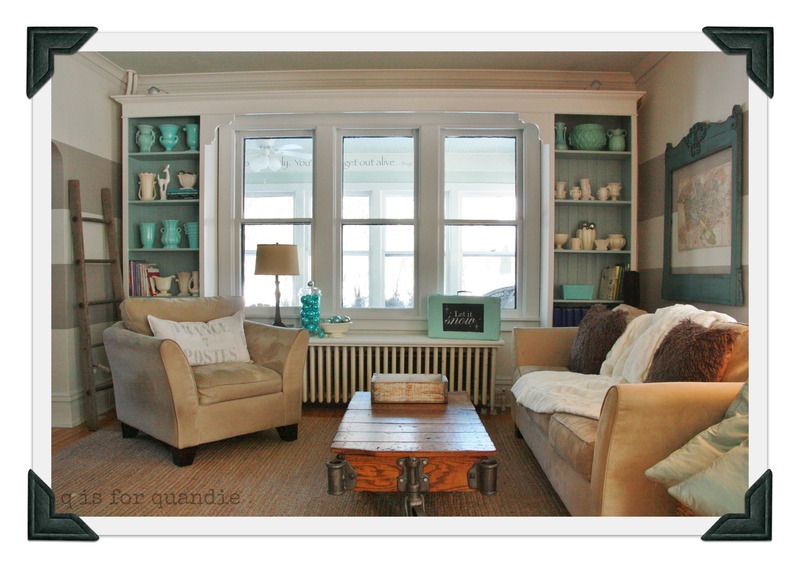 I agree….your “old” farmhouse is lovely! 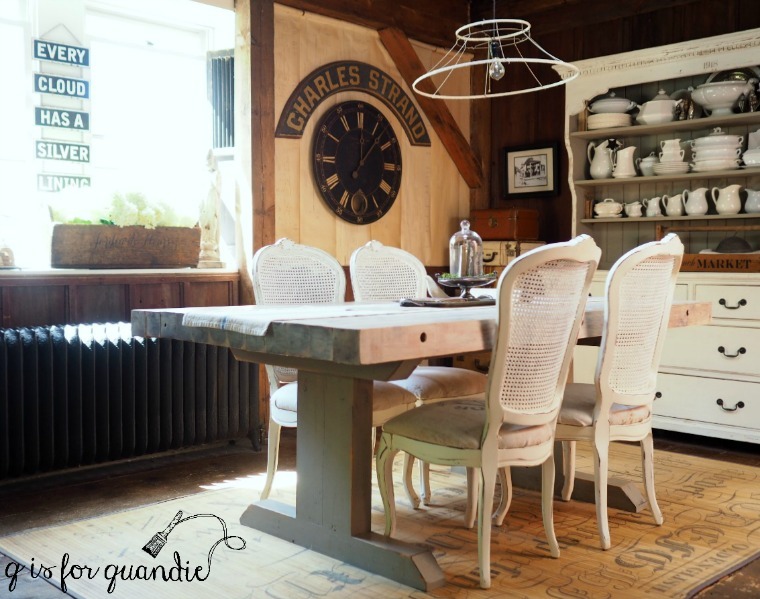 What you’ve done with it is simply amazing….every square inch has so much character; and the “summer house” is beautiful. 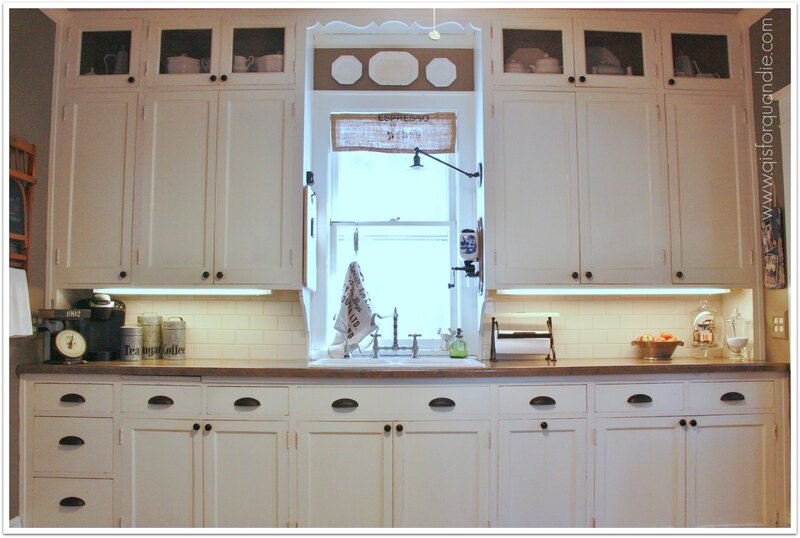 I love to see you’ve kept all the original cabinets in the kitchen! Truly gorgeous!! Thanks so much fellow Linda! I have to say, I am very happy that I have kept the original kitchen cabinets as well. They are over 100 years old and still going strong. They truly don’t make ’em like they used to, and these are likely to hold up for another 100 years. Can you say that about new cabinets? And truth be told, we couldn’t afford all new cabinets even if we wanted them 😉 Luckily we don’t. Thanks Kim! I’m with you on keeping the vintage kitchen. I wish I could have done the same with the bathroom too, but that had already been ‘updated’ when we moved in. One day I would like to ‘restore’ it with a more vintage look too. Well, this Saturday (Oct 4, 2014 from 10 a.m. to 2 p.m.) is your last chance until next June! I only do two sales a year. I’m super easy to get to from Hudson, I am near the intersection of 694 & hway 36. Hope you can swing by. Your Lucy looks just like our Maverick. He too is soft and fluffy, but he is sort of a jerk. 🙂 Just ask our other cats and the poor dog. Your house is great! Sounds like Maverick is in charge at your house 😉 And to be honest, Lucy is pretty much in charge here too, but she is a sweetie. She likes to be carried around on our shoulders, and she insists on sleeping on our pillows at night. She also regularly expects us to drop everything and pet her. I am truly thankful for my home. It’s not fancy, or large, or expensive, but it meets our needs and we love its charm. I hope you find your country house some time soon! Hi Judy! Thanks for your compliments! I do live in the Twin Cities. I am in Oakdale, just inside the 694 loop off hway 36. I have done a few classes here and there, but have found there isn’t enough interest to keep them going on a regular basis. My June 2015 sale will be on 6/11/15 from 5 pm to 7 pm, and 6/12/15 from 9 am to 2 pm. Hope you can come! 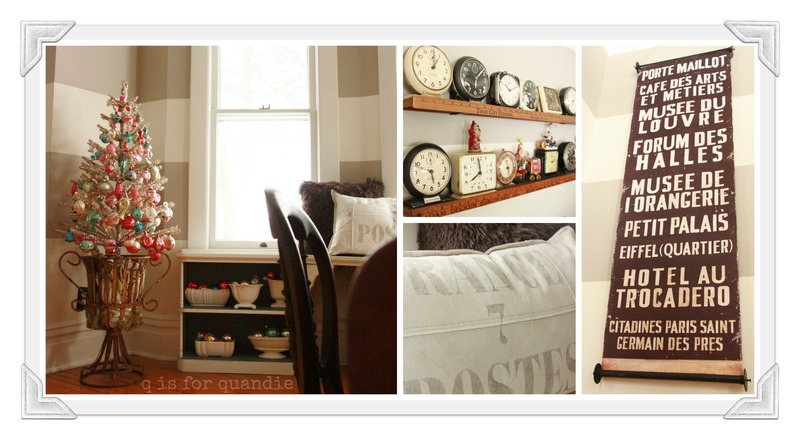 Love your home, your photos, your blog, Linda. Simply delightful! Thanks so much! Sending you an email with the 411 on my paint colors. Hi! 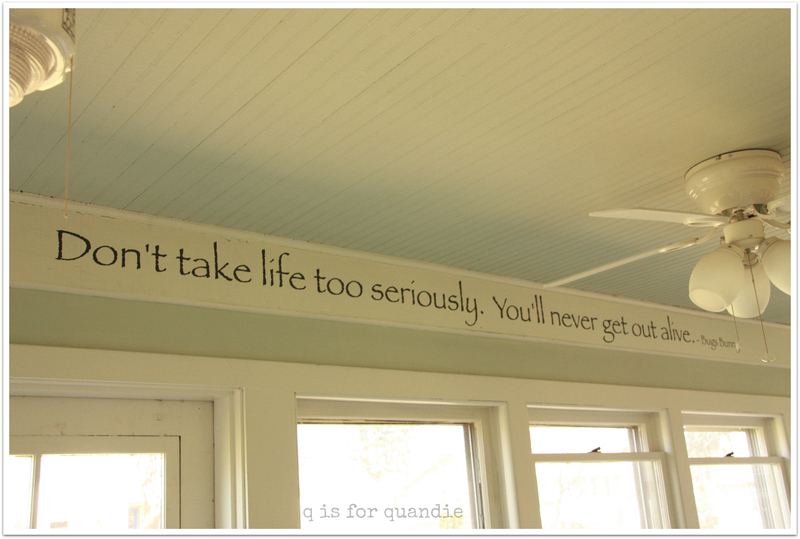 I just LOVE the white, square plate with the black writing you have pictured over here, hanging in your kitchen! Where you aware that it is in Norwegian? Or rather “old-Norwegian”? It says, “please cut the cheese neatly”. 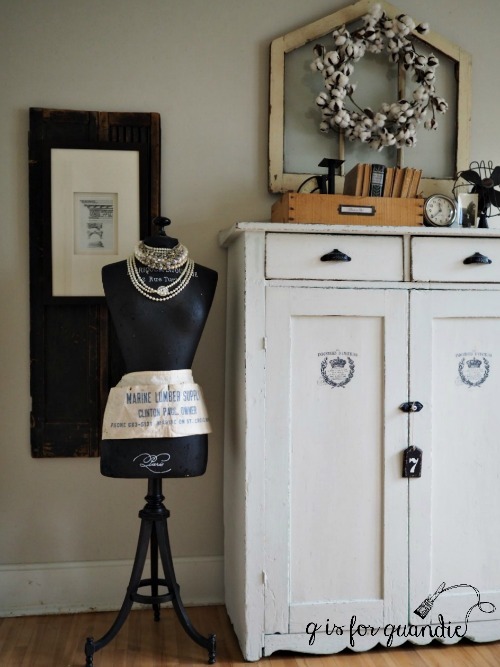 I recently found your Facebook page and blog, I adore it! Your home is stunning! Thank you for sharing! Thanks so much Geniece, and thanks for visiting! Thank you for the wonderful tour. I love all you gorgeous rooms. You did a wonderful job in each space. Thank you for sharing. I absolutely love your home! Everything you do is so special. You have an amazing talent! Thanks for sharing the wonderful tour! 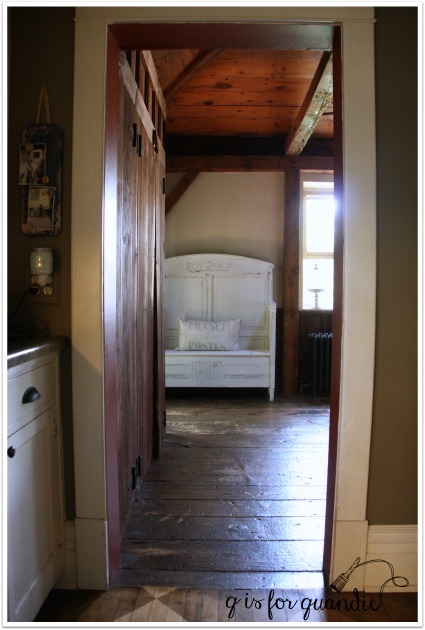 OMG, your beautiful farmhouse reminds me of many things that was in the farmhouse I grew up in. You don’t realize how beautiful something is until it gone, sometimes. Your home is breathtaking.